2019 Season Seats On Sale Now! Snag the best seats in the house to watch your hometown team! The Diamond Club presented by Olufson Designs is premium seating in sections C, D, & E, which is behind home plate and above the team dugouts. Beat the heat! Grab your season seats in The Block to comfortably enjoy chair-back seating in the shade. 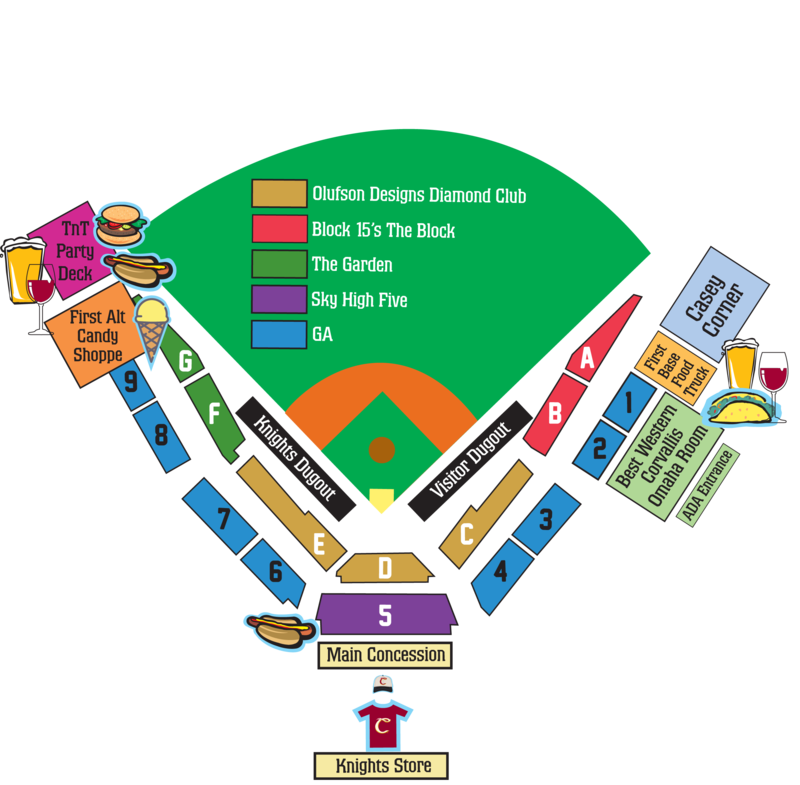 Presented by Block 15 Company, The Block includes sections A & B and is located down the first base line, which is conveniently located next to the first base food truck concession stand. “The Garden” includes sections F & G, which are located down the third base line with quick access to the TnT Builders Party Deck. The “Sky High Five” section 5 is presented by Sky High Brewing & Pub. Section 5 is the grandstand seating in front of the press box behind home plate and features comfortable chair-back seating and individual cup holders. Want to support your hometown team but not ready to be a season seat holder? Then this is the best plan for you! Select any sixteen games, including all fireworks nights, and reserve your favorite seat for all your chosen games. Find seats in section A, B, F, G & 5 at a winning value for any Knights fan. Make it to even more games this season and enjoy some of the best royal seats in the house. Your punch card gives you ten card “punches” that you can redeem however you please, such as two punches for five games, one punch for ten games, etc. Find seats in section A, B, F, G & 5 at a grand slam value. Punch cards can be purchased by calling 541-752-5656, at the office, by mail or at the Box Office. They are not available online. Our classic punch card gives you ultimate general admission flexibility. Go to ten games yourself or take friends to a handful of games. Our 3-game flex pass is perfect for a busy schedule! Find seats in sections A, B, F, G & 5 at a price that can’t be beat. Select any three games, including all fireworks nights! With this mini plan, you can secure your favorite seats for these games well in advance. There is no better place to gather than the ballpark. Reward your team and thank your customers with a group outing to Goss Stadium this summer. It’s a great place to relax, entertain and recognize key contributors. 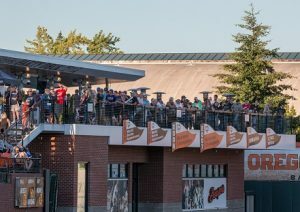 Host your next company outing in the Best Western Corvallis Omaha Room or on the TnT Builders Party Deck at Banners at Goss Stadium on the campus of Oregon State. Stay tuned for details on the NEW Casey Corner exclusive group area, available for the 2019 season! The Best Western Corvallis Omaha Room features a private restroom, flat screen TVs, bar and 63 outdoor seats that are accessible only from the Stadium’s luxurious suite. Reserve the Best Western Corvallis Omaha Room for your private party! Food & beverage is offered exclusively through the Knights and is not included in the below price. The TnT Builders Party Deck at Banners: Game and a ‘que! Treat your group t o a pre-game barbecue and enjoy the game from the TnT Builders Party Deck at Banners. With luxurious patio furniture and heaters, you’ll feel as if you are watching the game from your back porch. To check out the Best Western Corvallis Omaha Room and TnT Builders Party Deck experience, take our video tour by clicking here. For more information, to book your event, catering inquiries or to tour the stadium, please email Jennifer Beaumont at [email protected] or call 541.752.5656. There is no better place to gather than the ballpark. 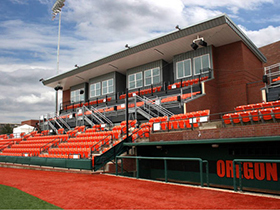 Reward your team with a group outing to Goss Stadium this summer. It’s a great place to hang, entertain and recognize key contributors. Take advantage of our special group rate of $6 per General Admission seat or $8 per Royal seat for groups of 10 or more. Group rates are not available for Fireworks Nights. Group discount is not available online. To receive the discount, call our office at 541-752-5656 or visit our office at 4th and Jefferson in downtown Corvallis. We also offer Knights Bucks (Concession Vouchers) in $5 increments good for any concession stand at Goss Stadium during the Knights season. For more information, to buy a block of seats, or to tour the stadium, please email Jennifer Beaumont at [email protected] or call 541.752.5656. Groups of 10 or more pay $9 per royal seat in all sections. Group rates are not available for Fireworks Nights. Royal seats are chairs with arm rests in sections A-G & 5. Groups of 10 or more pay just $6 per GA seat. GA seats are bench seating in sections 1-4 & 6-9. First come first serve. Our Guest Services staff will make sure your party is a home run. To book or plan your party, please contact Korey Kozaryn at 541.752.5656 or email her at [email protected]. -Ceremonial first pitch for birthday host. -Birthday announcement at game both on the PA and video scoreboard. -Signed card from Corvallis Knights players and staff. -Special access to between-inning on-field promotions. -Picture opportunities with Mack the Knight & Lil’ King. -Knights baseball shirt for birthday host. -Roped off group section for the birthday group. We are excited for you to use your seats for this upcoming season of Corvallis Knights baseball. Not only do we want you to have the best experience at Goss Stadium, but we want you to have the best experience before you even arrive at the ballpark. We encourage you to use our updated online seating account features, many of which are new for this season! To do this, click on the button below. From there you will be able to access your season seats and use all of our great features from our web portal. If you haven’t logged in before or are unsure what your log-in information would be, please contact Derek Buchheit by email at [email protected] or call the office at 541.752.5656 so we can help you get up and running. Treating your neighbors or business partners to a night out at the game? Did something come up that will make you unable to make the game? Don’t worry, we’ve got you covered! You can email your seats to whoever you like through your seating account. Ready to buy even more seats? Say no more. All you need to do is log into your seating account and you can buy single game seats. You won’t have to enter all your information every time, so you will be on your way faster than a stolen base. First access to best available seats and pricing. First access to your seats for playoffs. 20% Knights wearable merchandise discount at Goss and 4th & Jefferson team office. (Discount cannot be combined with other discounts or offers). All season seat holders will receive an exclusive gift at the start of the season. Season seat holders are encouraged to renew or purchase their seats early to ensure they receive their season booklet. All season packages have increased by $15 or less, each. HOLDER of each seat voucher assumes all danger incidental to the game, whether occurring before, during or after the completion of the game, including the risks of being injured by thrown or batted balls, bats, or any other equipment leaving the playing field. HOLDER of each seat voucher knowingly and freely assumes all such risks and agrees to hold harmless and not sue the TEAMS, PLAYERS, Knights Baseball Club, Inc. or Oregon State University for any injury or act that occurs at this event. Seat vouchers are not refundable for cash. In the event that a legal* or made up game is not played, seat vouchers will become a coupon, good for any subsequent game. Seat vouchers can be exchanged at the Box Office for the current season only, subject to availability. Guests prohibited from carrying weapons of any kind, including guns and knives, into Goss Stadium. No outside food or beverage, including cans, bottles, ice chests, hard containers or thermoses will be allowed in Goss Stadium, regardless of contents. No reselling seats on Stadium grounds. Any guest older than 3 years old must have a seat to enter Goss Stadium. Children in arms must remain in the lap of their parent or guardian. Accessing your Seating Account allows you to manage your own seats so that you have full control. Features include purchasing and renewing season seats, purchasing seat plans and single game seats, emailing your seats to others if you can’t attend and updating payment options and contact information. Never purchased seats from the Knights before? If you have any questions or issues accessing your account, please email Derek Buchheit at [email protected] or by phone at 541-752-5656.